I created the Hypnotic Weight Release Program to provide a client experience above and beyond a single individual Weight Reduction session, providing ongoing support. The program is designed to further assist in joining the newly formed habits and decisions in your subconscious mind with a series of 30 daily focus and action reminders. It provides a safe and supportive community who share similar paths toward a healthier lifestyle. 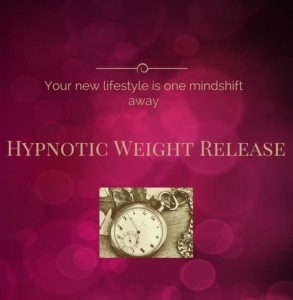 Hypnotic Weight Release assists you in successfully reaching your realistic lifestyle goals. A Full 1.5 hour session of Hypnosis, customized to your individual situation and challenges. Offered remotely (online) or in person at my office location in Burien WA. A download .mp3 audio recording of your session you can replay as many times as you feel is helpful. 30-Days of targeted emails to keep your focused on your health and wellness goals. Free Lifetime Membership into the Hypnotic Weight Release – Facebook Group, members who are like minded individuals focused on a healthy lifestyle,providing a nurturing and supportive community to help uplift, inspire and educate. A Second 1 hour remote Hypnosis Session to ensure your progress. Many times after we make our initial changes a new challenge that was underlying may surface, during this follow up, we’ll identify and address any other challenge areas related to your weight release. A second download .mp3 audio recording of the second follow up session to tackle any of the remaining challenges we identified in our call and keep you on track. Enroll Today by booking a Session or by calling 206-488-0766 today. This program is not a diet or quick fix , it is a lifestyle change. However, most participants have reported results of releasing 1-2lbs per week, having more self-control and a positive feeling about their accomplishments, health and overall wellbeing. You are worth the investment! We are all Designed to Live!